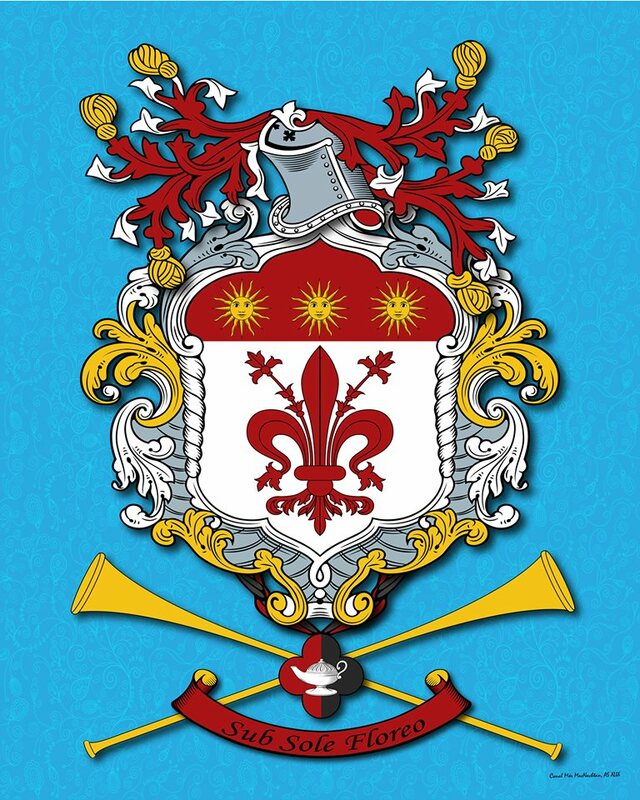 First, we should cover what Heraldry is. From what I’ve learned so far it is a system developed before 1600, in order to visually identify people, their places, and their things. Heralds in the SCA help members with their identity in the Society (i.e. their persona du jour, their persona name, or their “coat-of-arms” which we call a “device”). Anyway, on a field of battle the easiest way to know who was on your side was to see them “bearing arms”, or holding a shield painted with colors and symbols. 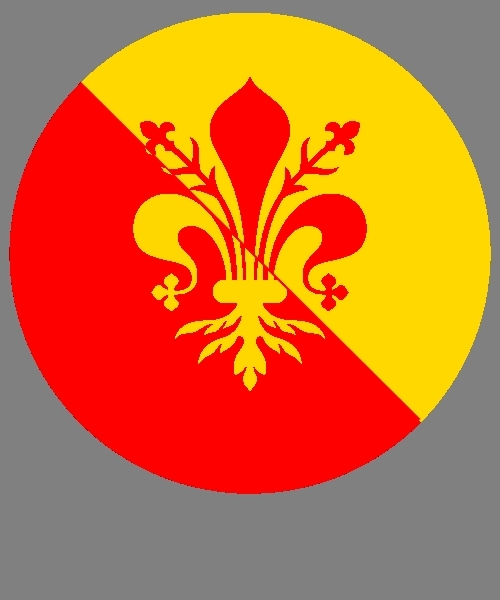 Everyone holding a shield with the same color and symbol (stemma in Italian) as you was your friend in battle. Those holding something different were the enemy (or perhaps your ally, so you had to know!). In the beginning a person, not a family, had a stemma, or what we call a device in the SCA. Once you receive your Award of Arms, your device is known as your arms. A word about the “achievement” you see around my arms. In general, amongst kingdoms which regulate Achievements: Supporters are granted to Peers (single) or Royal Peers (double). Crests are granted to Peers or holders of Grants of Arms. Helms, torses and mantling are allowed for those who have received an Award of Arms. Mottoes and compartments are allowed for anyone. Here I only have designed mantling, which is that name for the red and silver acanthus leaves around my arms. The words one uses to describe what is on a device is called a blazon. It’s a language of sorts, based on the terms for the colors and symbols used in the middle ages. Blazon is important because in absence of photocopy, the only way you know how to reproduce a device is by the language of the blazon. My device is blazoned; Argent, a fleur-de-lis, and on a chief gules, three suns-in-splendor Or. Using that, any herald in the known world would be able to draw or reproduce what is shown as my device above. My device is on my pavilion, to show that “this is me!”. My badge (shown below and used on my belongings to show “this is mine!”) is blazoned; Per bend gules and or, a fleur-de-lis countercharged. To learn more about blazons, arms, and armory click here for a quick visual introduction to heraldry or here for the SCA Heraldry Primer. If you are interested in learning about book heraldry, feel free to read this handout for my class entitled Name Consult 101 by Fleurtyherald, the links in the handout take you to the Heraldry Site for the SCA. 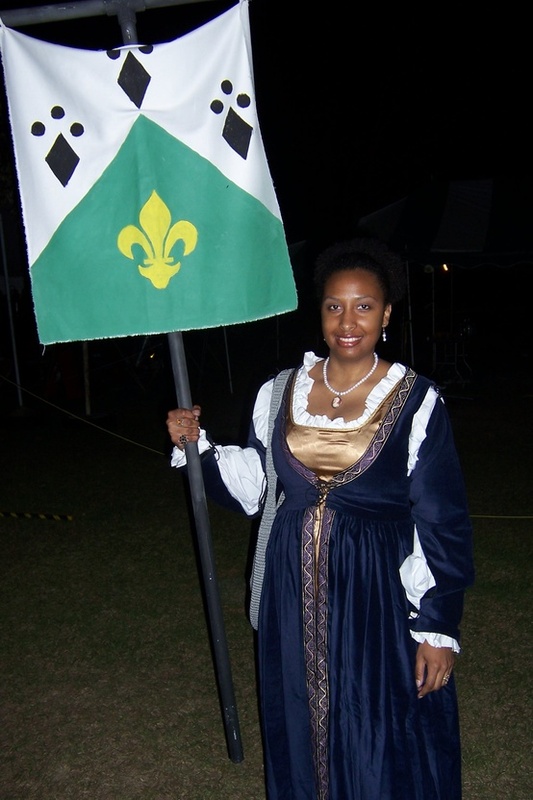 Speaking of ‘standards’, this is me holding a standard for Master Charles de Bourbon during his elevation ceremony.